While senior condos and apartment communities for retirees still exist today throughout Florida, there are other Florida retirement communities that offer the quality of life choices you have earned. 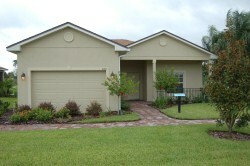 Here at Vienna Square, we have re-invented retirement to provide you with the active adult lifestyle that you deserve. 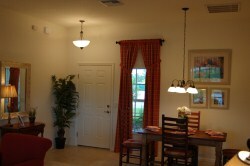 At Vienna Square we have elegant maintenance-free villas. You enjoy all the convenience of low maintenance typically found in a senior condo community, but no stairs or elevators to deal with. Also, our luxurious homes come in only four units per building, so you have more privacy than is found in many large senior condo or apartment buildings. As with many senior condos, there is no exterior maintenance to worry about. All yard work and landscaping services are taken care of. There is a reserve for roof replacement and exterior painting. All the common areas are maintained, plus villas come with basic 78 channel cable service, a monitored home security system for your safety, a security gate with personal remote access and a two car garage! Something that would be hard to find with senior condos or in apartment communities. Like some great senior citizen communities, we have a variety of activities and amenities to keep life fun! Our clubhouse has everything you need: a fitness room, billiard room, library, a 30 seat movie theater, and a grand ballroom for dancing and community celebrations. There is also a swimming pool that is heated all year round, a spa and tennis courts. You can use the facilities whenever you like, and participate in the organized activities each month. As we age, our needs change, either temporarily as medical needs arise or permanently as aging progresses. Vienna Square has a wonderful feature we call our Continuing Care Campus, where we have everything you need for assisted care or rehab after a hospitalization. Couples can stay together while one of you needs care, so that you can continue to be there for each other. Our nurse’s station is always available, and our rehab center helps you get and stay in the best possible health. You can take real comfort in knowing there are plenty of helping hands around. Contact us for a free information package and learn how we re-invented retirement and why Vienna Square is so much more than the senior condos or apartment communities available in Florida today.